It is Official...We achieved LEED PLATINUM Certification!!!!! 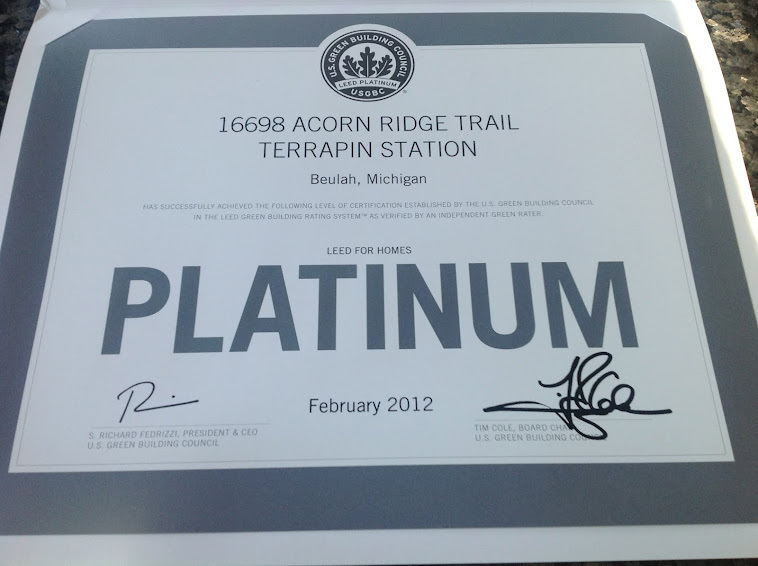 The first residential Platinum house in Benzie, Grand Traverse and Leland counties and one of a handful in the entire state of Michigan. Follow the journey of Jack and Barbara and our adventure of building a sustainable Cottage on Turtle Lake in Northern Michigan. It is official - LEED PLATINUM CERTIFIED!! Well, here it is 2016. Another summer is coming to an end. The summer on Turtle Lake has been spectacular. It is with much sadness that it is time for me to start a new journey in my life and sell this little slice of heaven. My love and soulmate spent 20 months battling that terrible, horrific disease of pancreatic cancer. Jack succumbed and was able to exit his debilitated body May of 2015. I've never met a more courageous man. His original diagnosis was 3 weeks to 3 months after diagnosis and he fought valiantly for 20 months. Since Terrapin Station was our dream home and dream life, it just doesn't seem right to continue to stay here. So, I have decided to move back to Grand Rapids MI and have purchased a condo Downtown. I said I would never move again...what is that lesson about "never saying never"??? I would love for our home to go to the type of person who values sustainability, the beauty and solitude of nature while having all the creature comforts. Here is the link to the listing: http://www.zillow.com/homedetails/16698-Acorn-Rdg-Beulah-MI-49617/2098160186_zpid/. There have been over 14000 hits on this blog. I want to thank all of you for your interest in our story and who knows, I just might build another LEED Platinum home during my next journey. It is hard to believe two years have past since we moved into Terrapin Station. The house has had time to settle as have we! Another summer is coming to an end, the song birds aren't singing as loud, the lake has a cold look to it and the tourists or "fudgies" as we call them have gone home. The hummingbirds are still here building up strength for their upcoming journey to the south. 1. Geo-Thermal - Always choose a Closed-Loop system. Originally we put in a Open-Loop system. We use a well and have a great deal of Iron in the water. This ended up causing major issues with the Geo-thermal and well. So much so that we ended up spending $13,000 to change from an Open- Loop to Closed - Loop system. 3 new wells were dug, along with much of our roadside yard and piping for the new loop. Neither Jack and I can remember having a discussion about the type of system, Open or Closed. But, I am sure we did and since we needed to cut over $100k out the construction, we probably said let's go with an Open system and save $13k.....Poor Decision! The technology for Geo-Thermal continues to get better each year and much knowledge has been gained in Geo-thermal by the professionals. So, we saved both our regular well and Geo-thermal system and it should last longer than we will. We chose not to add solar hot water to our solar and in retrospect, that would have been a good idea. Heating water is a significant consumption of electricity. Other than the above, we couldn't be happier! Our House was on TV! Jack sent out press releases to announce our LEED Platinum cerification. The response has been very good. Our local NBC affiliate asked to interview us and yesterday Brody McConnell interviewed us and it made the Morning News. It was all very exciting. A Home Energy Rating is a measurement of a home’s energy efficiency, used primarily in the United States. Home energy ratings can be used for either existing homes or new homes. A home energy rating of an existing home allows a homeowner to receive a report listing options for upgrading a home’s energy efficiency. The homeowners may then use the report to determine the most effective ways in which to upgrade the home’s energy efficiency. A home energy rating of a new home allows buyers to compare the energy efficiency of homes they are considering buying. Our home will be using GeoThermal for heating and cooling. Click the link below to learn how it actually works. Insulating Concrete Forms (ICFs) are formwork for concrete that stays in place as permanent building insulation for energy-efficient, cast-in-place, reinforced concrete walls, floors, and roofs. The forms are interlocking modular units that are dry-stacked (without mortar) and filled with concrete. The forms lock together somewhat like Lego bricks and serve to create a form for the structural walls or floors of a building. ICF forms are currently manufactured from any the following materials:Polystyrene (Expanded or Extruded) - most common Polyurethane (including soy-based ones ) Cement-bonded wood fiber Cement-bonded polystyrene beads. Concrete is pumped into the cavity to form the structural element of the walls. Usually reinforcing steel (rebar) is added before concrete placement to give the concrete flexural strength, similar to bridges and high-rise buildings made of concrete. Like with other concrete formwork, the forms are filled with concrete in 1–4 foot "lifts" to manage the concrete pressure and reduce the risk of blowouts. After the concrete has cured, or firmed up, the forms are left in place permanently. Education Session - What does LEED Certification mean? LEED Certification stands for Leadership in Energy and Environmental Design and is the nationally accepted benchmark for the design, construction, and operation of high performance green buildings. Certification assures that a building project is environmentally responsible, profitable, and a healthy place to work. In addition, LEED-certified buildings qualify for tax rebates, zoning allowances, and other incentives. Everyone wants to cook with this view! Wow I just saw a turtle in Turtle Lake! Joel is presenting us with the keys to Paradise! Hand painted tiles from Portugal - Awesome! The view is awesome - so is Jack!!! Nov 20 - We have a garage door! Perhaps they will strike oil! Breakfast with tea - Ahh! See how high the sand mound is! Barbara is the Queen of the Mound as least!